Kristy at Quiet Play (here) is a talented young Australian designer. 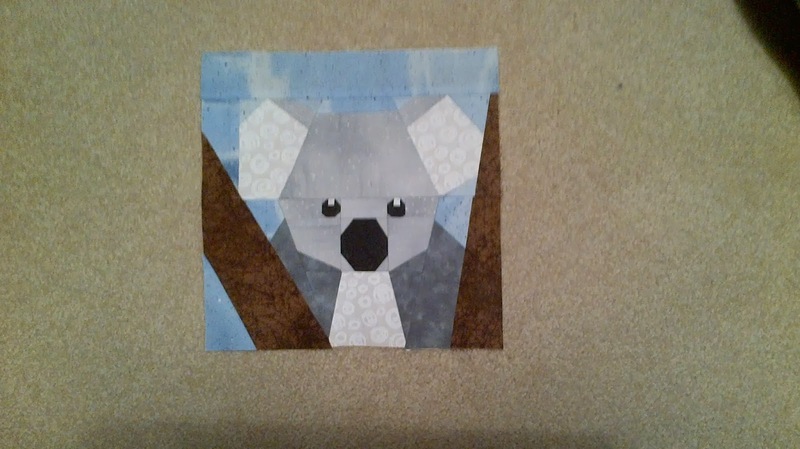 I have had the good fortune to test a few of her paper pieced blocks. She will be releasing a set of Aussie animals and another set of Woodland creatures in early February. All the blocks are currently out for tested. 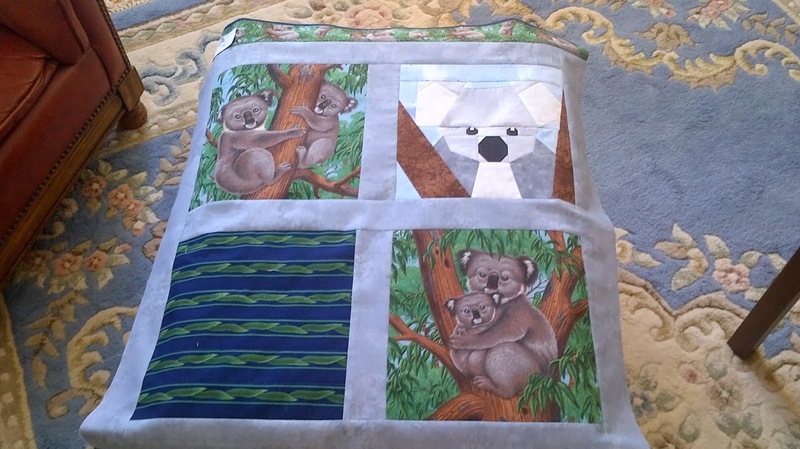 I asked for a Koala this time and must have been at the front of the line because that is the pattern I got. This little quilt measures 30" by 32". The pinwheels came to me as bonus triangles in a baggie after our Guild's Mystery workshop a year ago. 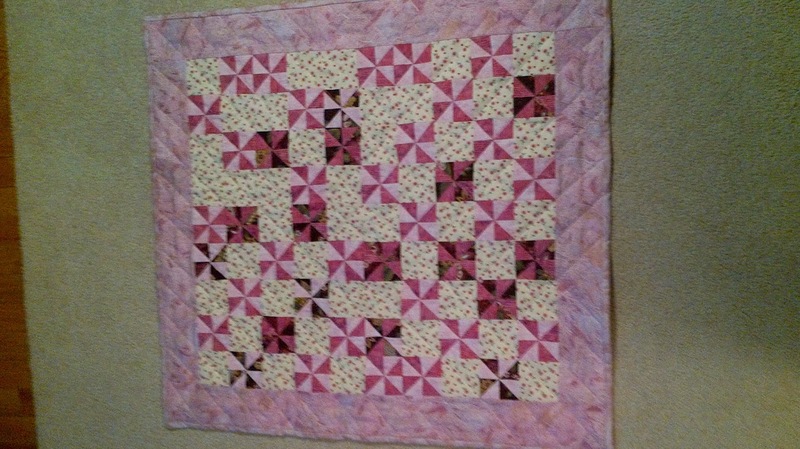 I turned the triangles into pinwheels and found a white with pink print and cut squares the same size as the pinwheels. then some random assembly add a border and quilt. I do like to "make something from nothing". In many cases the triangles would have joined the garbage. 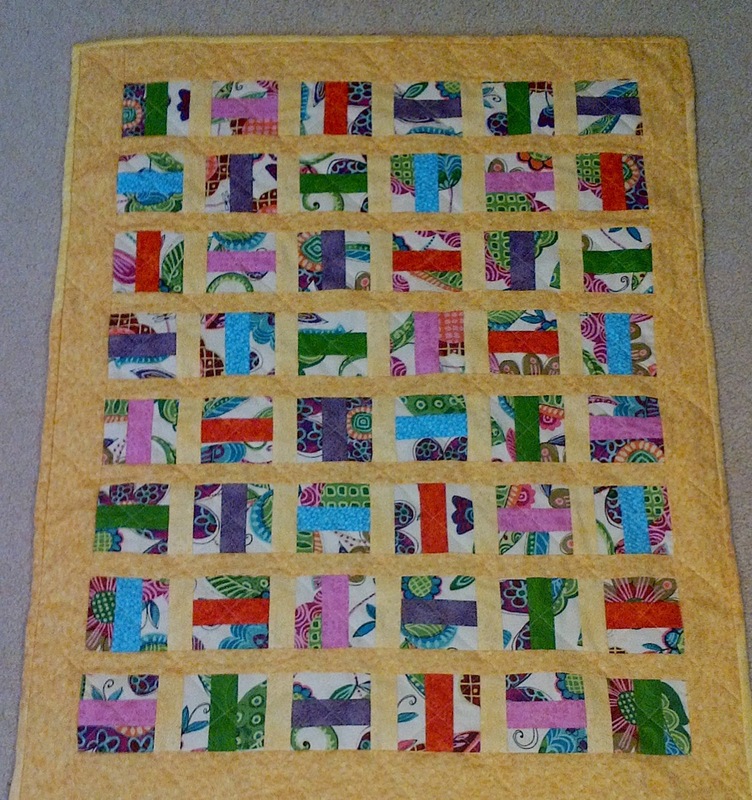 This cheerful baby quilt was, as is normal for me, made from scraps.Each block consists of three strips and each of those strips measures 1 1/2" by 3 1/2". I set them so they alternate in orientation vertical, horizontal etc. To extend the scraps I added sashing between the blocks and rows. With the border added the final dimensions are 30" by 36". 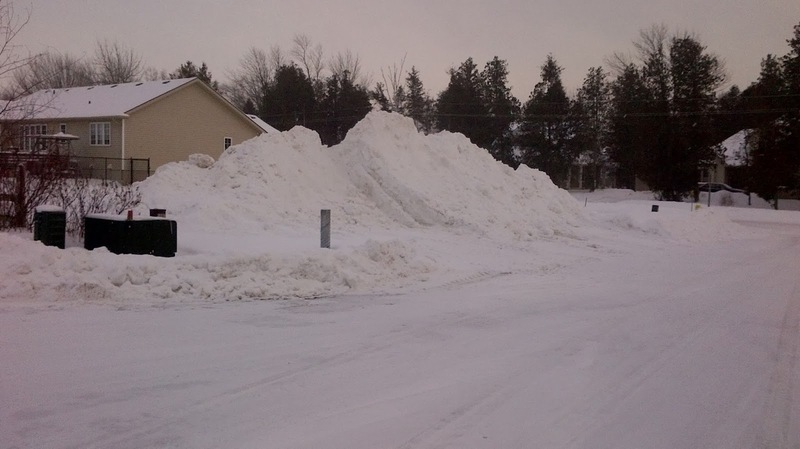 Because our Kincardine Sunset Quilters Guild meeting was postponed (the highway was closed due to blowing snow) I will be able to take it next week for a Project Linus donation. So lets hope the roads stay open. In January 2013 Diane Harris at Quiltmaker magazine challenged us to collect our empty spools to see how many we used over the year. In addition to these empty ones I have been using a couple of different large cones of Cansew cotton. I suspect they will empty out over the course of this year. 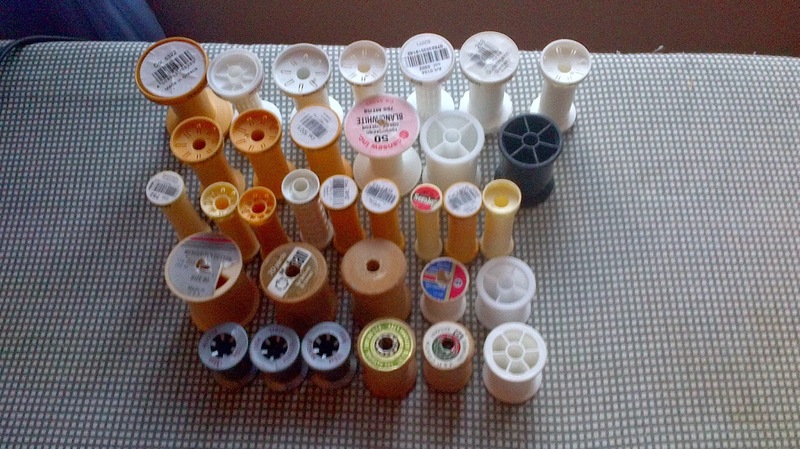 I have always saved the spools. they make good pulleys for Science class and the variety of shapes and sizes make them good for a sorting activity for the primary classroom. Most years I attend the Science Teachers Association of Ontario annual conference and have a bag for my colleagues. I keep a book (not an electronic list) and my new pages are set up. One page for finished quilts and one for books read. I did start a UFO list and decided that would not be focused on the positive. I looked back over my books read list for 2013 when asked to pick a favourite five and came up with this small list, not in any particular . The Orenda by Joseph Boyden. It has a lot of violence in it that is very graphically described but at the same time it tells the story of the early days in Canada from a different perspective than we normally get. How the Light Gets In by Louise Penny. This is the latest Inspector Gamache book and the best one yet in my opinion. The series is very character driven. I have read them in order and would recommend doing that but she has gone on record as saying that is unnecessary. The Ghost Bride by Yangsze Choo. In this book a poor Chinese girl is asked to be the bride of a dead rich Chinese man. there is a lot of Chinese folk lore about the afterlife in this story. W is for Wasted by Sue Grafton. What can I say, every book is like a visit with an old friend. I suppose once we hit Z I will have to start over at A if I want to visit. Three Souls by Janie Chang is the last of my mini five. Another one with a lot of folklore about the afterlife built in. It complimented The Ghost Bride quite nicely. At this time of year many new BOM's and Quilt Alongs are starting up. I am resisting for the moment as I have so many quilts that are started one way or another and they need to be finished.